Fandoms reaction to the Star Trek: The Motion Picture teaches us a lot about the best and worst of fandom. Fans love extended cuts of movies. Fans love directors cuts to movies. In some cases, it’s because the final product doesn’t meet expectations. In other times fans just like to see what could have been. One recent example is Justice League which is a critical and box office disaster. Fans of director Zack Snyder have been campaigning for the Snyder directors cut to be released by Warner Bros. They even staged a protest outside the studio to petition the release. That’s not going to happen since Warner Brothers have already lost an estimated $100 million on the film after rewrites, reshoots, and marketing. They aren’t about to sink any more money into the film to pay for the massive special effects required to put back in unfinished scenes. But why do fans care so much about extended or directors cuts of films? We can learn from the history of fandom. Back in the 1980s and 1990s "pre-internet", there was a popular fandom magazine named Starlog. It was the best way to keep up on the fandom and connect with other fans. Thanks to the Internet most of the issues are archived. 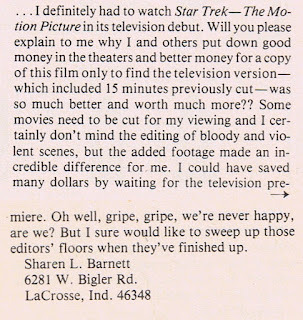 In Starlog #72 (July 1983) the "Communications" letter page was filled with complaints about the recent telecast of Star Trek: The Motion Picture on ABC. Why? Because the network had added about 15 minutes of footage missing from the theatrical and home video release. Fifteen whole minutes! It was an outrage and fans ran to their mailboxes to spit their hot rage at the travesty! It's the old time equivalent of a Twitter meltdown. Here are the letters and a breakdown of the four types of genre fans. Which are you? First, there's the fan that feels he's wasted his money buying or seeing any other version of the movie. We wuz robbed! 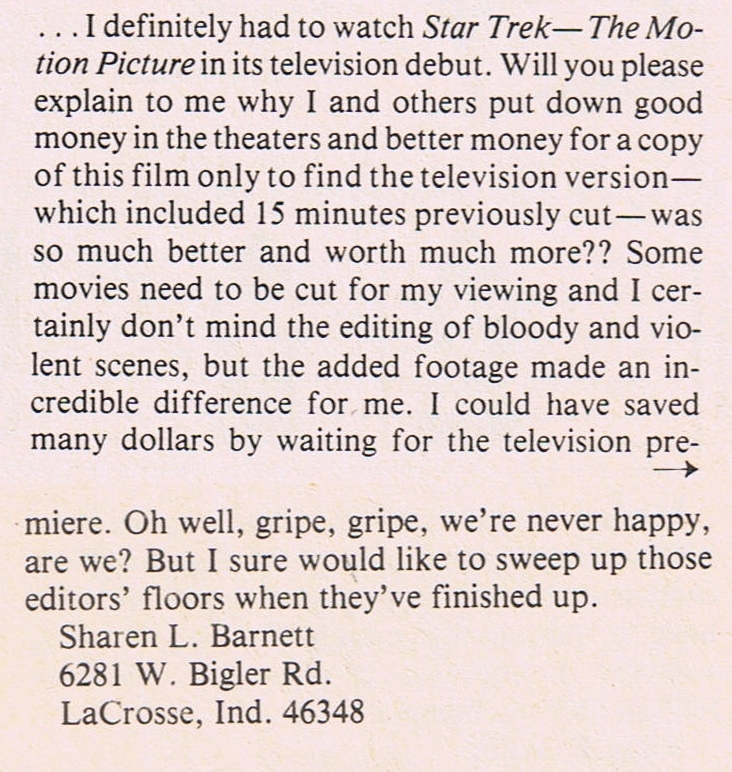 Seriously, ABC's telecast of Star Trek - the Motion Picture, with its 15 minutes of added footage, was a revelation on the choices that are made when editing a film. What was not revealed, however, was just why STTMP's editors made the choices they did. It seemed as though all the scenes deleted from the movie's initial release contained just those little touches of humor, character development, and plot explication that the film was originally criticized for lacking. Quite a few incidents were presented more clearly, ranging from McCoy's reluctance in the transporter to Ilia's character (including the cryptic "oath of celibacy") and various discussions about V'ger's nature. The most criminal omission was Spock's weeping for V'ger towards the end-a marvelous insight into the transformation he had undergone, not to mention a foretaste of his character in Star Trek II. Small wonder that cast members, when interviewed, so often have some justifiably bitter remarks about the cutting room floor. Nor do I think anyone would have minded the film's extra length in theaters; CE3K [Close Encounters of the Third Kind] (which went through its own TV reincarnation) was two hours, 40 minutes long, but I never saw anyone leave. And where will it happen next? When Star Trek II is telecast a few years down the road, will it contain discarded footage about Sulu's captaincy; how Khan knew Chekov; Scott's nephew; Saavik and David? The point is, I feel less and less like trusting the filmmakers to know what to cut, and more like telling them, "Just show me all the footage you've got and I'll decide what I don't like!" Sorry, guys, but it's just that there's a sense of somehow being cheated when we see the theatrical version several times, perhaps buy the videocassette later and finally see the TV broadcast with all those extra scenes. How will we ever know when we're getting the most complete product? Second is the fan who feels that 15 minutes of the extra film completely changed the movie experience. ...I definitely had to watch Star Trek- The Motion Picture in its television debut. Will you please explain to me why I and others put down good money in the theaters and better money for a copy of this film only to find the television version - which included 15 minutes previously cut - was so much better and worth much more?? Some movies need to be cut for my viewing and I certainly don't mind the editing of bloody and violent scenes, but the added footage made an incredible difference for me. I could have saved many dollars by waiting for the television premiere. Oh well, gripe, gripe, we're never happy, are we? But I sure would like to sweep up those editors' floors when they've finished up. Now here's a fan who thinks the movie should be re-released with the additional footage. He also hopes for a new TV show to be created with "new characters or actors to eventually replace the original ones". should look into gathering any spare footage and re-edit ST- TMP into a movie with a more coherent plot. They could re-release it like CE3K-SE on videotapes and discs and/or in theaters. ABC's broadcast raised an interesting observation: on TV, commercials successfully broke the action up into interesting segments (good job, editor). I think Star Trek may work best on TV. I wish Gene Roddenberry, Harve Bennett and crew could get together for two to three months a year and film a couple new episodes to be broadcast six months apart. Paramount could release the episodes on video. I love the universe of Star Trek. I think its future lies in combining the hard science of SF seen in ST-TMP with the adventure of art seen so richly in Trek II. I also think Trek should grow and obtain new characters or actors to eventually replace the original ones. The triad of Kirk-Spock-McCoy is one of the ingredients that makes Trek work so well. This could be repeated with: a female captain, Lt. Saavik-logic, and Dr. David Marcus-emotion. The original cast could stay on as supporting characters, whatever would best fit the interests of the actors and the universe of Star Trek. The British TV show Dr. Who grows with different actors playing the main character. This is the '80s and time for Trek to evolve into something new. Evolution and growth aren't easy and it sometimes hurts, but think of the exciting possibilities! As fans, let's welcome any evolution an growth. The human adventure is just beginning. Steve gets his wish with the incredibly popular Star Trek: The Next Generation and a female captain in Star Trek: Voyager. So, way to go Steve. 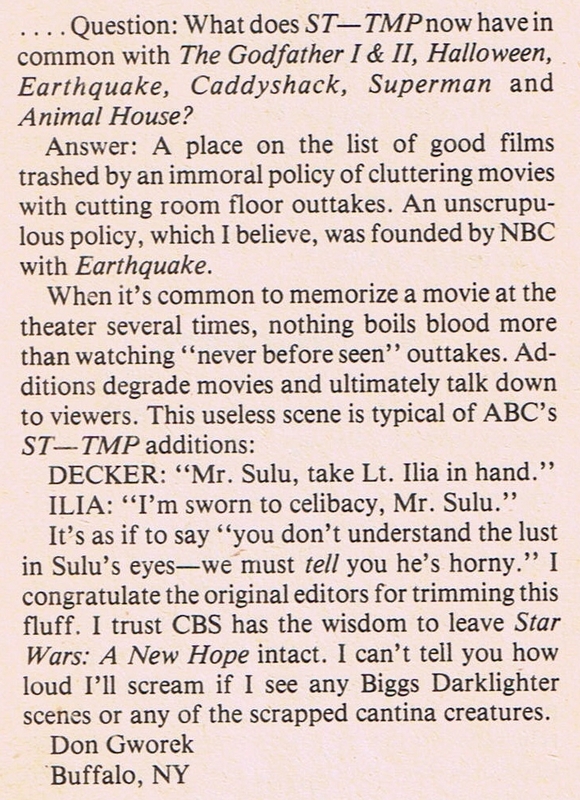 Finally, there's the fan that wrote in to say he doesn't want an extended version of Star Trek: The Motion Picture. In fact, he thinks the extra clips ruined the movie completely. ...Question: what does ST-TMP now have in common with The Godfather I & II, Halloween, Earthquake, Caddyshack, Superman and Animal House? Answer: A place on the list of good films trashed by an immoral policy of cluttering movies with cutting room floor outtakes. An unscrupulous policy, which I believe, was founded by NBC with Earthquake. DECKER: "Mr. Sulu, take Lt. Ilia in hand." ILIA: "I'm sworn to celibacy, Mr. Sulu." It's as if to say "you don't understand the lust in Sulu's eyes-we must tell you he's horny." I congratulate the original editors for trimming this fluff. 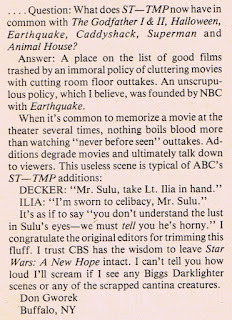 I trust CBS has the wisdom to leave Star Wars: A New Hope intact. I can't tell you how loud I'll scream if I see any Biggs Darklighter scenes or any of the scrapped cantina creatures. So you can't please everyone. Still, in a way, it's comforting to know that fans of every generation want more from their movies. They just couldn't complain in real-time in 280 characters. Which fan are you? Which fan is your favorite? Which fan do you hate the most?